As if to remind me that I need to get a move on with my decorating (I’m going to make the spare room into a cat-free zone so I can make things in there), this May has had a bit of a sewing theme. Earlier in the year I created a logo for Swinky Doo of County Kerry and this month I’ve been working on some leaflets to promote Karen’s beautiful handmade work. She makes stunning personalised pictures and bunting for children, adults, babies, weddings – anything you like. She has also just launched her brand new website and I’ve been making banners for that too. 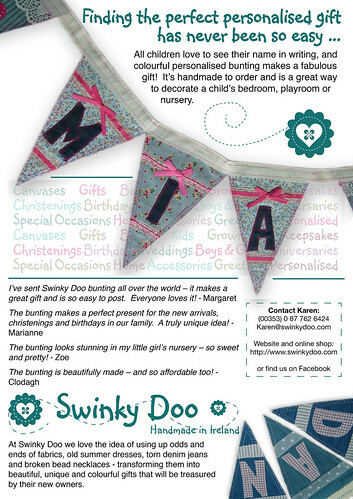 At Swinky Doo we love the idea of using up odds and ends of fabrics, old summer dresses, torn denim jeans and broken bead necklaces – transforming them into beautiful, unique and colourful gifts that will be treasured by their new owners. Why not check her out. She ships to most places and you can be guaranteed a unique gift or keepsake. She’s on Facebook too. Today I got some exciting news from fellow Southsea resident and maker of wonderful things, Georgina Giles. Every month, Georgina picks the name of one of her subscribers out of a jar and the lucky person gets a present in the post. This month it was me! 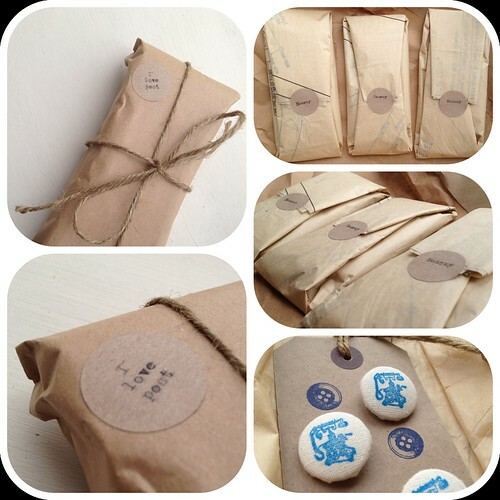 I am so looking forward to receiving these lovely hand stamped, fabric covered buttons. Take a look at her blog – and why not subscribe? You might be next month’s winner. I don’t know what I’ll do with them yet, but I’d better get on with sorting out that sewing room! Sign up to this blog to hear about updates as soon as they’re posted. Update: Georgina delivered the parcel to me today. So beautifully wrapped, and the buttons are gorgeous.